Today’s post is from Dr. Bruce Erickson. He is currently the chair of the department of history at LeMoyne College in Syracuse, NY. EDITOR’S NOTE: Points is thrilled to welcome Hannah Palin (Film Archives Specialist) and Nicolette Bromberg (Visual Materials Curator) from the University of Washington Libraries, Special Collections. The University of Washington has a wonderful collection of materials by the British filmmaker and journalist Adrian Cowell. Beware, alcohol and drugs historians– once you read their descriptions of the Cowell collection, you might be tempted to book your tickets to Seattle! In January 2015, the University of Washington Libraries, Special Collections, received 6 pallets of materials shipped from London. They were stacked high with boxes of 16mm film, audio and videotape, photographs, newspaper clippings, transcripts and log books—covering three decades of work by British filmmaker and journalist, Adrian Cowell. 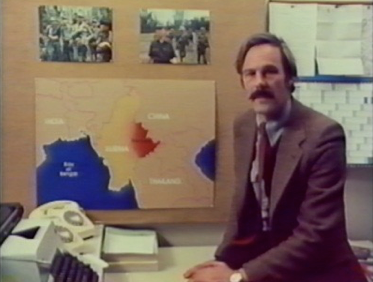 From the 1960s to the 1990s, Adrian Cowell created television documentaries detailing the complex relationships between minority insurgents in a remote region of Burma and the international opium trade originating in Southeast Asia. The Adrian Cowell Film and Research Collection contains Cowell’s work tracking the opium trade from its production in Burma to the addicts and dealers in Hong Kong to the drug policy makers in Washington, D.C. It includes the most extensive collection of images of the remote Burmese Shan State in the world, gathered during Cowell’s trips documenting opium merchants, opium caravans, militias, insurgents and other activities related to the opium trade. A year and half after its arrival, Special Collections’ staff, students, and volunteers are still slowly working their way through the collection of over 2000 items, most of which have never before been made public. On February 28, 2013, the People’s Republic of China executed the Myanmese (Burmese) drug trafficker, Naw Kham (Ch. Nuo Kang 糯康, Th. Jai Norkham), and three associates for the 2011 murder of thirteen Chinese boatmen. What was notable about this particular capital case was the preceding live broadcast where cameras followed Naw Kham in his last hours until moments before his execution by lethal injection. The state media CCTV footage, excerpts of which are available online, can seem slightly surreal. A little before his execution, the prisoner is shown in what looks like an office waiting room surrounded by fruit and snacks as if he were a guest. However, he is shown seated, facing what seems to be a large pink vomit bucket—an aberrant reminder of his impending fate. 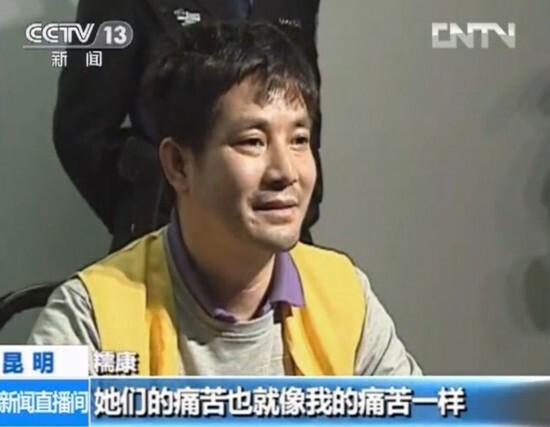 In the aftermath of the broadcasts, several human rights organizations as well as Chinese netizens criticized the state’s handling of this execution. Although the human rights and capital punishment aspects of this case have been the objects of critical scrutiny, the international relations and substance policy issues have received far less attention in the media. The execution of four foreign traffickers, as well as the unprecedented multinational manhunt leading up to their arrest arguably represents the culmination of a ramped up Chinese war on drugs that is being waged domestically and, increasingly, internationally. Many scholars of drugs and alcohol that are engaged in comparative work within plural linguistic environments are already aware of the problems of translation. 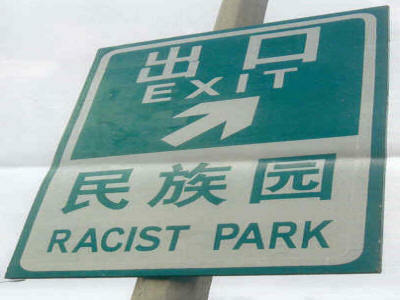 The encounter with compilations of mistranslated signs and slogans that many of us may have had in our first language courses have constituted some of our earliest brushes with the pitfalls of translation. (E.g. : Bangkok Dry Cleaner’s sign: “Drop your trousers here for best results” or an earlier version of KFC’s “Finger Lickin’ Good” slogan—“Eat your fingers off” 吃掉你的手指头.) Translation, it seems, can be dangerous. Identified as in Shanghai, but likely a sign for Beijing’s Ethnic Culture Park. Editor’s Note: We close our symposium, fittingly, with a post from Yong-an Zhang, Director of the David F. Musto Center for Drug Policy Studies and Professor of History at Shanghai University. He was a visiting fellow of the Center for Northeast Asian Policy Studies (CNAPS) at the Brookings Institution and a visiting professor of History of Medicine at Yale University’s School of Medicine. Dr. Zhang’s research interests include the social history of drugs and medicine, international drug control policy, drug diplomacy, and China’s drug control strategy. He is the author of Policy Choice in Changing Society: A Study on American Marijuana Policy (2009); Asia, International Drug Trafficking, and U.S.-China Counternarcotics Cooperation (2012); and co-author of China’s Urban Health Risk and Social Governance (2012). In the fall of 1999, I was participating in a seminar on Modern Chinese History by Professor Cheng Shuwei in the Department of History at Northeast Normal University. This seminar led me to understand that opium and other drugs had played a very special role in Modern Chinese History. As a graduate student of American history, I became convinced that I needed to understand the role that drugs played in American society, and how the U.S. government, civil society, and the public responded to the world’s first global commodity. When I myself raised these issues, I suddenly realized that I could not find satisfying answers in general texts on American history. On weekends, I started going to the Scholar Bookstore to look for books that would help me. Then one weekend—to my great surprise as the book had not been there when I’d looked the previous weekend—I found a recently published book: Meiguo Jindu Shi (The American Disease: Origin of Narcotic Control). 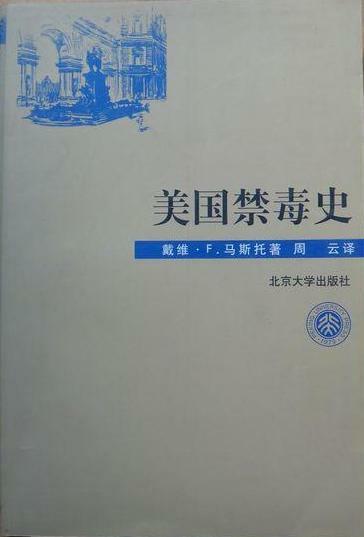 The Chinese version was based on the third English edition and had been published by Beijing University Press that very year. After briefly browsing the contents, I knew it was the book I was looking for. I immediately bought it and finished reading it that weekend. To my mind, it is full of novel wisdom in almost every chapter, every section, and even each page. Professor Musto was familiar with all of the relevant archives and primary materials—nothing was recycled, nothing second-hand. According to my perspective, the Chinese version of The American Disease should have been the first classic manuscript to be translated and published in China. It offers a comprehensive account of drug use and government drug policy from the 1860s to the 1990s; it explores the origins of narcotics control in international and domestic contexts; and it examines the interaction between politics, health, and ideology during the development of American drug policy. It casts the American concern with narcotics as “more than a medical or legal problem—it is in the fullest sense a political problem.” Furthermore, it explains the “energy that has given impetus to drug control and prohibition” as resulting from “profound tensions among socio-economic groups, ethnic minorities, and generations—as well as the psychological attraction of certain drugs.” More importantly, it opened my beginner’s eye to re-thinking the complex dynamics of American history, particularly medical history, social history, and constitutional history, through a new perspective. In the past, Milton Friedman has argued that companies have minimal ethical and social responsibilities outside of avoiding legal transgressions and satisfying their shareholders, but this position does not seem to have broad public appeal in corporate boardrooms or on main street today. Definitions of corporate social responsibility (CSR) have not remained static over time, but broadly, it’s founded on an understanding that “business organizations have societal obligations which transcend economic functions” or that there is some “obligation to work for the social betterment” (Epstein 1989, 585; Frederick 1995, 151). In practice, a wide variety of programs and policies can fall under the CSR umbrella, including: scholarships for underprivileged youth, mentoring minority students, donating proceeds for disaster relief, among others. However, see Whitehouse 2006, Carroll 2001, and Wood 1991 for the general academic consensus that there is, well, no consensus on the meaning or implementation of CSR. Editor’s Note: Today we welcome the return of guest blogger Toine Pieters, Descartes Institute for the History and Philosophy of the Sciences, Utrecht University, who wrote memorably about the use of “sewage epidemiology” as a tool for tracking drug use a few weeks ago. His post today is slightly more conventional, but no less cutting-edge. This is a corrected version of the original post. Thanks to Hans Bosman and Toine Pieters for working out the edits and amendations. –eds. For most of us coca and cocaine production and distribution is synonymous with Latin American drugs cartels and Colombian drug lords. It is also common knowledge that Britain and other European empires ruled the waves during the 19th century opium wars and up to the 1920s did everything to frustrate the American-led war against drugs. Only those who read Joseph Spillane’s Cocaine: from Medical Marvel to Modern Menace (2000) may remember that by far the most successful alternative coca growing venture outside Latin America before 1945 was in the Dutch East Indies on the island of Java. Spillane briefly mentions that Dutch colonial coca production began to dominate the global markets in the1910s and crowded South American producers from these markets. It is not farfetched to argue that the Dutch were the drug lords of the interbellum and continued to play a prominent position in the global narcotics industry after World War II. Up until recently we knew relatively little about the halcyon days of Dutch drug production and trade. But on November 8 the 82 year old former employee of the Dutch Cocaine Factory (NCF), Hans Bosman, defended his thesis on ‘The history of the Nederlandsche Cocaine Fabriek and its successors as manufacturers of narcotic drugs, analysed from an international perspective’ at Maastricht University.